Over the past weekend, Hurricane Irene passed through our region. She made landfall last Saturday in North Carolina and made her way through Virginia to the state of New York and further up north. Needless to say that we had some very anxious moments. Just the fact that a hurricane is coming straight at you is quite scary, I tell you. We were well prepared for Irene's visit: our fridge and pantry stuffed with lots and lots of groceries, candles and flashlight ready to go and a battery operated radio in case of a power outage. Luckily we could stay put in our little apartment, no evacuation necessary. 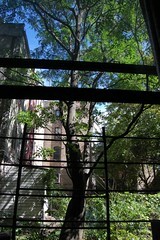 With a big huge sigh of relief, I can now report that Irene has left our part of Manhattan completely unscathed. We feel so lucky that Irene spared us! Her wrath did not touch us at all. Not even in the aftermath. Our hearts and thoughts are with the victims of Hurricane Irene. Many in our region are impacted during her visit, and many are facing huge problems in the aftermath. Hunkered down in our apartment this weekend, I focused on my knitting. 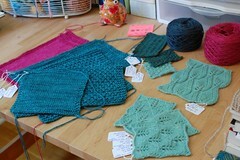 There wasn't much I could do otherwise than keep my needles clicking and making tons of swatches. Since the yarn company Jade Sapphire has asked me to design a line of patterns for the upcoming TNNA in January, I have had the pleasure to play with their Cashmere. Often times, during swatch making sessions, the yarn will tell me what it wants to be. It is a very adventurous journey! 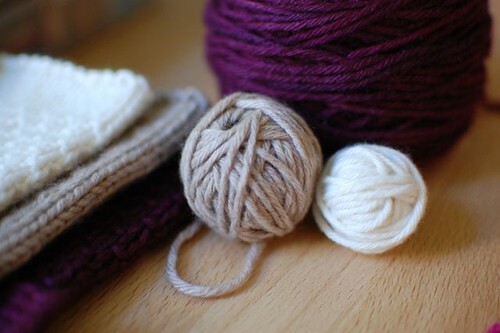 I love to see how yarn behaves in different stitch patterns. 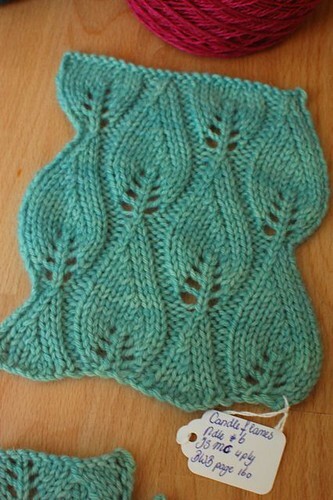 And I even use several different needles to see what fabric the yarn yields and how the stitch pattern holds up. 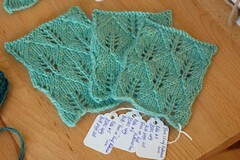 Not only did I swatch with cashmere but I also worked with Jade Sapphire's 2-ply Silk Cashmere. This wonderful 55% Silk and 45% Cashmere blend is really talking to me big time and I am taking my time to acquainted with how it knits up and what fabric it yields. I have been very organized too with my swatches. 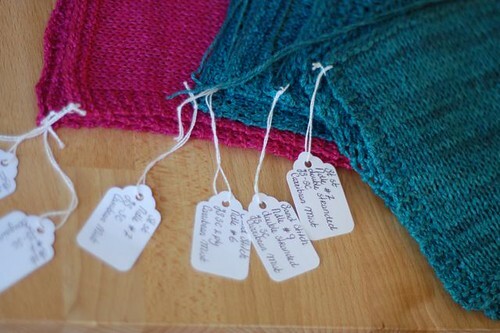 Everything is labeled so that I remember what needle size and what stitch I used. Very handy for when I am ready to write up the pattern and knit up the final design. I simply cannot wait until I am able to show you what I have designed with this gorgeous yarn... I am so terribly excited! Before, I used to blog openly about designs in progress and show you lots of pictures in detail while the design is developing. Unfortunately, I cannot do that anymore. But as much as I can I will talk about the progress and after the design is released I will write about it in more detail. During Irene, apart from making swatches, I completely focussed on a new fingerless glove design with Jade Sapphire's Mongolian Cashmere 6-ply. That deep purple with flex of darker purple really makes me yearn for Fall. I am debating whether I should name this fingerless glove after Hurricane Irene... Should I? I don't know about that yet. Irene has caused severe damage ever since she came into existence and has taken 32 precious lives in the USA. The force of nature should be respected! Again, we are so lucky that Irene spared us. I thank the Universe on my bare knees that Irene did not take my loved ones and that no inconvenience was caused to us. For those who have felt Irene's wrath during her presence and in the aftermath, hang in there. My thoughts are with you and I am sending you strength! Submitted by Anonymous on Sat, 09/03/2011 - 03:02. Submitted by JelliDonut on Wed, 08/31/2011 - 21:07. I'm so glad all is well with you. That must have been pretty scary! Loving that last photo with all those yummy swatches--nice to know something great came from your experience. Submitted by Nancy Ricci on Fri, 09/02/2011 - 11:00. Thank you, I am also so glad all is well with us after the storm. Making swatches is so much fun, no matter what the weather conditions!